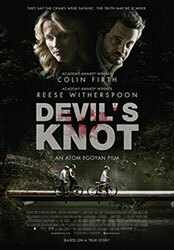 (January 24, 2013 – Toronto, Ontario) My interest in Devil’s Knot began as a simple exercise to see what Atom Egoyan could do with a script he hadn’t written or adapted. While the majority of his films have sprung from his own fertile mind or been written by him but based on an earlier work — The Sweet Hereafter comes to mind — the screenplay for Devil`s Knot was cowritten by Scott Derrickson and Paul Harris Boardman. Early criticism of Egoyan`s film was primarily based on how the screenwriters had stayed too close to the known facts, providing little new evidence. It was also pointed out that three documentaries had been made and that there was hope this first dramatic re-telling of events would somehow go beyond the facts. If you don’t know the story, Devil’s Knot is based on true events that took place in 1993 and 1994 in West Memphis, Arkansas. Three very young boys were murdered and eventually three teenagers were accused of killing the kids as part of some satanic ritual. After being in jail for 18 years all three men were released from prison in 2011 while agreeing to a special plea bargain that allowed them to proclaim their innocence while admitting the justice system had enough evidence to convict them. With the film’s release it seems critics are still irked that Egoyan didn’t push the truth further. They are somehow miffed that he didn’t bend the truth to point a finger at some known or unknown character who could be blamed for the senseless murders. I think that`s a cheap shot. As the director said, I was one of those people who wasn’t aware of the original story, or if I was had buried it beneath so many layers of reported injustice in the American justice system. I came to the film wholly ignorant of the facts and left thankful that I had not been fooled into thinking one of the characters, possibly an invented perpetrator, was to blame for the deaths of those three innocent boys. What Egoyan has achieved in Devil`s Knot is putting ignorance, superstition, prejudice and small town “rush to judgment” mentality on trial. Anyone leaving the theatre knows the three convicted teenagers were railroaded into giving up 18 years of their lives. One of them, condemned to death in the original trial, could have lost much more. 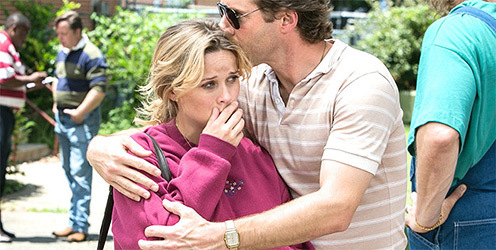 The performance by Reese Witherspoon — playing the mother of one of the dead boys — is excellent, particularly in one heart-rending scene. The arc her character travels as the film unfolds never strays too far from reality and you never forget she is playing the role of a real woman, a real mother, who lived these real scenes. 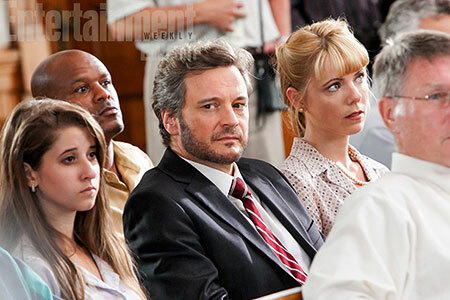 Colin Firth`s cool seething does much to make you forget that doing American accents may not be one of his strongest attributes but his lurking presence in the courtroom provides a slim sense of hope that in all trials someone is there to witness the path of justice. Canadian actor Bruce Greenwood, an Egoyan favorite, plays the role of the trial judge so well you may end up not liking the actor because of the man he portrays. While the expression is “justice delayed is justice denied,” in the case of this judge it seems swift justice no matter the facts is all that’s important. Look for Elias Koteas, another Egoyan regular in a small role, and for Kevin Durand who delivers a powerful performance, this time playing the adoptive father of one of the murdered boys, Christopher Byers. I have not talked to the director about this film so I cannot report if he was at all tempted to stray from the path dictated by the original script, but I think he has done a masterful job. It is one thing to direct your own screenplay, something you have spent months or years developing and making perfect, it is quite something else to be entrusted to overlay your vision on the work of someone else. While some may complain that Egoyan should have gone further even if that meant inventing some evil, fictional character, I disagree. What makes this movie work is the fact that beyond the deaths of the children, almost every other real life character has been damaged by these events, some possibly beyond repair. And as the final credits roll and the lights come up and as we leave the theatre, we are left to deal with the real mystery. Somewhere out there, perhaps still living in West Memphis, Arkansas, a killer walks free. Ralph Lucas is the founder and publisher of Northernstars.ca. 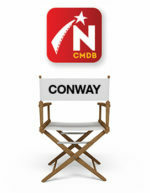 He began reviewing movies while in radio in Montreal in 1976.